No sewing post. I really haven't had time to sew, nor the desire. I mean, do people even really read blogs anymore?! I admit... my blog reading truly did slow down after google reader went kaput. I just never quite figured out my new reading regime, and realized that it was the perfect opportunity to focus more on real life instead. You know. Be where you are. Pay attention to the things right in front of you that are most important. I know I wasn't living that way as a sewing blogger, constantly sewing, and posting. I realized it was futile. I was wasting my precious time. I was finding my worth in things of this world. I wanted to be known by random people over making God known. Nothing like getting pregnant to completely slow you down. Now that I am finally regaining some energy in the 2nd trimester, I've noticed that my hormones are turning me into some sort of household management guru-organized, must have cleanliness in my home, kind of mom. And it's pretty hilarious, especially because compared to the last 8 weeks where I have done nothing (N-O-T-H-I-N-G), but wallow in misery, as my body is making another human, and allow my whole house to go to haywire. And you thought, I was joking... that was my sewing stash PRIOR to me organizing it like a crazy woman! It's funny how these two pregnancies are different. With Cai, my hormones brought out all of my creative genes. I HAD to learn to sew. I HAD to create! I HAD to get a sewing machine. I HAD to! This time around, I'm noticing all I seem to care about between nausea waves is that my floors are not gritty, that clutter is OUT OF HERE! And that everything has a place. Dirty dishes in my sink? NO! So, I thought I would share some of the websites that I am loving right now to improve my household organization! Meal Planning: I truly NEVER meal planned. At least not in the formal sense. However, this week, after eating the same random stuff for the umpteenth time, I decided I have to change that! I'm trying a free trial at Plan To Eat. It's fantastic! I really am loving this website. I'm not sure if I can continue after the free trial, because we have really tightened up our budget lately (note* it is NOT very expensive, so we will see), but I love how easy it is to use. Literally, you just drop a recipe link into it, it saves your recipe which you can add to a queue, which you can then use to plan out your week's meals. After those simple steps, then it makes your whole grocery list. I seriously love that last part! It made me shop SO MUCH WISER at the grocery store this week. And I know I saved money, because I only bought what was planned, not just random stuff, most of which ends up not going together or goes bad! Weekly House Cleaning: I have posted on this blog, before, that I love FlyLady, and her weekly motivation to keep a clean house. I somehow got out of the habit of using her site, but the last couple weeks, I've started again, and it's helped me SO much to focus on what needs to be done. I love the daily challenges, and it helps that everything is broken into babysteps, so that I don't feel overwhelmed. I've also hired a college student for $10/hr that comes every other week to help me get the house cleaned. Budgeting: My husband handles most of our budgeting, but we've decided this month to switch to a cash base budget using an envelope system, instead of using our credit card all the time. We do use our credit care still (to which we just have 1), but have starting using it ONLY for automated bills that are easier to pay online. That way, we know exactly how much is on there, and we don't just charge and charge, as was the case, before. It's truly amazing how different you feel about spending money when you see your hard earned cash being spent versus just on a debit card! It's making a huge difference in our mindset on what we really NEED vs. WANT, what we should SAVE for, and what could wait. We use MINT to keep track of our finances.The app is GREAT and perfect to check where you are spending. Couponing: Okay, I truly admit that I dislike couponing. I enjoy saving money, but all the time spent figuring it out, printing them off or cutting them out. It kind of drives me crazy, BUT, doing a little bit can help. 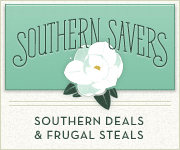 I use a website called Southern Savers to check out good deals in my area. Even if I can't clip coupons, I can see who has better deals and where I should shop. I love Aldi, so I find shopping there over other grocery stores (without couponing), I save more money comparitively, but I can't get everything at Aldi, so being mindful about what I AM spending and where, really helps me to save money. Alright, I'll leave you to ponder all this... I told you... this pregnancy is making me crazy, maybe in a good way! You just might need to find sewing inspiration someplace else!